Home / MP Tom Blenkinsop visits the campus! MP Tom Blenkinsop visits the campus! 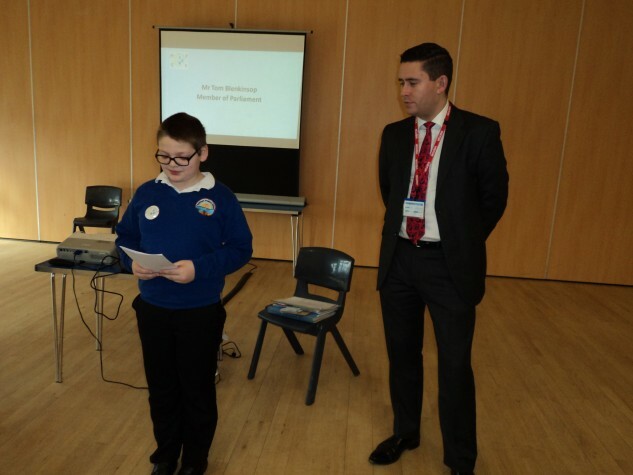 Children from schools across East Cleveland had the opportunity to question the local MP Tom Blenkinsop on Friday 6th March at a meeting for the East Cleveland Children’s Council (E.C.C.C.) held here at Saltburn Learning Campus. The idea to get children together from different schools came from the children of Whitecliffe Primary School and Will Shaw from Galley Hill Primary School, who suggested an East Cleveland Children’s Council. It was then set up in September 2014 by former Headteacher, Mrs Chris Shannon, as a chance for the children from East Cleveland to have a ‘voice’ on issues that affect their local and surrounding areas. There are 18 schools on the council with 2 representatives from each, plus staff to support them. Meeting once every half term at rotating host schools, the council has been working extremely hard developing a logo and letterhead as well as aims and objectives. They have led on various competitions to design leaflets, posters and a Playground Charter to go in all playgrounds in East Cleveland. Grant Hopkins, the lead for the East Cleveland Cooperative Trust, said, ‘the ECCC is a powerful voice which will allow the children and young people the opportunity to let those who can change things in their community know what needs doing’. Mr Blenkinsop was tremendously impressed with the Children’s Council after meeting them on the day; he said it ‘set a precedent’ for other such councils to be put together in other areas of the country and was happy to discuss the possibility of supporting the children with their aims for the E.C.C.C in the future. He talked very proudly of East Cleveland and was especially keen for the children to have a ‘voice’ and to use it; emphasising the importance of putting their messages out there and drawing others in to help. Tom also discussed how the council could make a ‘better impact’ and how the government could support the work. Some very good questions were put to Tom, such as ‘do you think the government does enough to support teenage and children’s services?’, to which he said he believes strongly in children’s rights; he gave some good suggestions on how the government could support children and young people, such as the National Citizen Service and outreach youth and leadership programmes. The children were excited at the possibility of being invited to Parliament in the future after the general election in May. The current project of the E.C.C.C is to put their Playground Charter onto signs to go in all local parks. The charter talks about ‘thinking before you do’, using equipment safely and generally respecting each other and playing nicely. All members have been writing letters to local businesses and clubs, asking if they will help support funding for the signs, to which they have had an excellent response. A competition for designing the signs is also taking place, with fantastic entries so far – the winner will be chosen at the council’s next meeting in May. The E.C.C.C. is appealing to any businesses or people who would like to support the signs, which cost £25 each – they will need 30 signs to cover the whole of East Cleveland, helping towards young people feeling safer in their local playgrounds. If any readers wish to contribute or need any more information, please contact Mrs Rayson on our campus email address.